Introduction Vocal cord dysfunction (VCD) is a little-known condition that frequently masquerades as and coexists with asthma resulting in misdiagnosis and mismanagement.1 Speech & Language Therapy (SLT) is the mainstay of management though treatment efficacy is yet to be proven. We report on VCD patients clinical outcomes prior to and post therapy. Method All patients referred to a tertiary VCD centre with nasendoscopy-confirmed VCD diagnosis and completed SLT input were considered for this study. 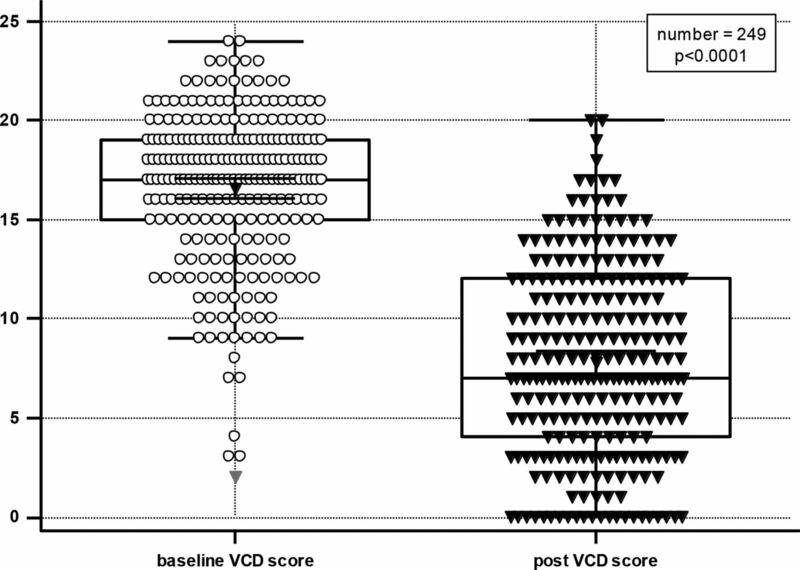 Clinical outcomes were recorded on the local VCD registry. Symptoms scores were collected pre and post SLT using an in-house designed symptoms-based VCD questionnaire (scale 0–25 with high score indicating poor control). Pre and post therapy frequency of VCD attacks and the annual pre and post therapy hospital admission rates were also collected. Results Demographics - Two hundred and forty nine patients with nasendoscopy confirmed VCD diagnosis completed SLT. This cohort was comprised of 200/249 (80%) females with a mean age of 45 years (range 14–77), mean BMI 30.9 kg/m2, 203 (82%) had associated asthma diagnosis, of which 125 (50%) were on maintenance oral corticosteroids . Symptom management – Frequency of attacks dropped following SLT with 179 (72%) reporting daily attacks pre-SLT to 25 (10%) noting daily symptoms post-SLT. A significant reduction in patient-reported symptoms was noted post SLT; pre vs. post therapy; mean (± SD) = 16.57 (3.96), 7.75 (4.82) respectively, p < 0.0001. See Figure a. Hospital admission prevention – significant reduction in hospital admissions was noted in the year post SLT intervention: pre vs. post therapy mean (± SD, range) = 2.44 (4.84, 0–31); 0.31 (1.01, 0–7); p < 0.0001. Conclusion SLT improves VCD symptoms scores, reduces VCD attacks frequency and hospital admissions. Further work is needed to improve overall VCD recognition and management through development of a national VCD database and regular networking of clinicians working in this area. Ayres JG, Mansur AH. Vocal cord dysfunction and severe asthma. American Journal of Respiratory and Critical Care Medicine 2011;184(1):2–3.